As a non-profit organisation we rely on your support to continue our work in schools and providing support to writers. You can also join our newsletter to get the latest news, events, courses and stories to your inbox. This month we’re celebrating Granta Magazine’s 40th anniversary. Check back for new articles and extracts every week! In a turbulent world where news is fake and facts are fiction, books, words and ideas have never been more vital. As portals to new worlds and ways of seeing, they have a special magic that guides, provokes and illuminates us. 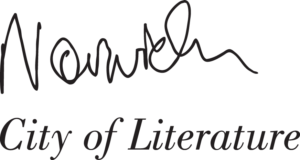 Programmed in partnership with the National Centre for Writing, literature events at the Festival celebrate Norwich as a UNESCO-designated home to writers, thinkers, storytellers and readers. The National Centre for Writing is based at Dragon Hall in Norwich. In 2012 we led the successful bid for the city to become England’s first UNESCO City of Literature, joining a prestigious and growing network of creative cities worldwide. We continually celebrate Norwich’s heritage as a place of ideas, where the power of words has been changing lives for hundreds of years. We nurture the city’s contemporary writers and through our UNESCO Young Ambassador programme support young people to share their love of reading, writing, books and ideas with their schools and wider community. Icons by Smashicons and Freepik from Flaticon.